This is one of the coolest charts I have ever seen. And I say that knowing full well that it could make me as a UFO Field Investigator completely redundant and even obsolete. 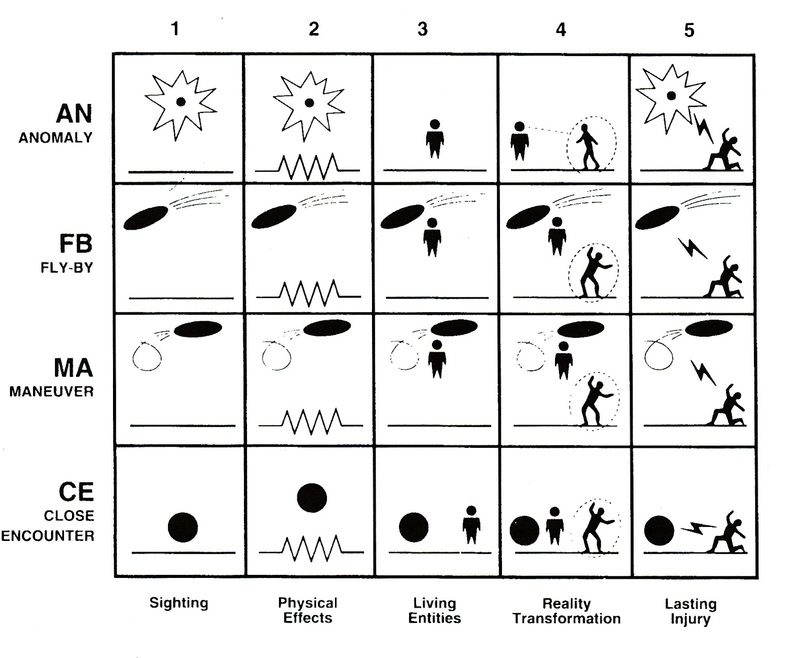 This is the "Vallee Classification Chart," developed by UFO researcher Dr. Jacques Vallee to help stick people describe their UFO experiences in pantomime. Because it is included in the MUFON Field Investigator's Manual, I can only assume that I will someday be interviewing a stick figure about his or her encounter with the unknown... And what an unknown it is! Black Frisbees that loop-the-loop and fire lightning bolts! Deep, V-shaped furrows and ridges in the ground! Transformations in reality that involve being surrounded by a dotted line! If this chart accomplishes one thing, it proves that a UFO encounter can be lively, terrifying... and FUN! It's easy enough to follow: The rows separate UFO experiences into four distinct categories of phenomenon, while the columns differentiate UFO experiences into five distinct levels of witness involvement. So an AN1 sighting would involve a simple sighting of an anomaly in the sky, a UFO encounter at its most basic. My two UFO sightings since I started writing this blog fall into AN1 territory. 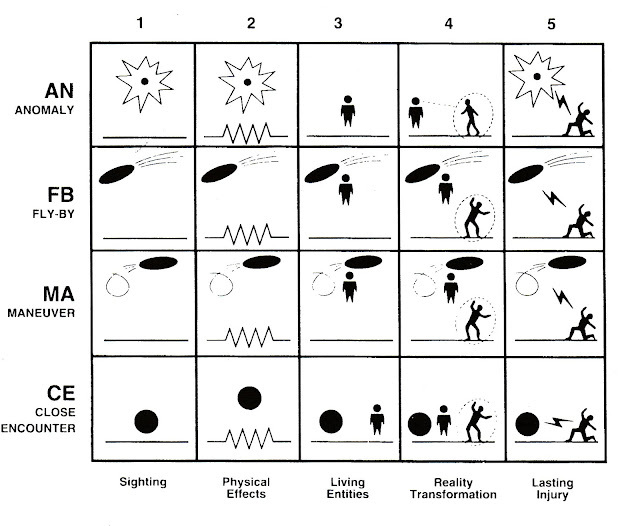 At the opposite end of the chart, a CE5 sighting would involve a stick figure's direct physical interaction with the phenomenon, resulting in a lasting injury to the stick figure, who, it must be admitted, appears to be in a great deal of distress. It all makes sense until you get to column 4, "Reality Transformation." Every other category on this chart is designed to keep the investigation on solid ground, reliant on facts and facts alone, and that's always a good idea when dealing with MUFON Field Investigators who tend to go off on alarming flights of fancy when investigating UFO sightings. But Reality Transformation wrecks the whole thing, because it just throws the door open for all sorts of purely subjective balderdash and poppycock. Take this, for instance, from the MUFON Field Investigator's Manual's description of a AN4 incident: "AN4 are those anomalous reports in which witnesses experience personal interaction with entities in the reality of the entities themselves. They include near-death experiences, religious miracles and visions, and many cases of out-of-body experiences." Which I might be able to accept, if it weren't for the fact that the Manual has just described AN3 encounters as those involving "associated entities" that "could involve reports of ghosts, yetis, and other instances of cryptozoology as well as elves and spirits." So, what we're really talking about is possibly a witness describing entering into a yeti's reality, or perhaps an elf's reality, and then having a near-death experience and witnessing a miracle. That's a UFO encounter how, exactly...? Don't get me wrong. I am not opposed to reality transformations at all. I think they are to be encouraged, in fact, especially if they involve being trapped inside a dotted line, as depicted on the chart. And, as I have stated here many times before, I am a big fan of Dr. Vallee, and any categorization scheme he cooks up is a-ok with me.